This campaign has been so overwhelming, and with so many highlights that I don't know where to start!! Samoa Cosmetics has been on the Lebanese market for 40 years! I discovered it when i was a kid in my mom's vanity, and was always amused by the image of the samoa woman, confident and cheeky at the same time... Then the years passed and somehow it was always part of the scenery, but in a more demure way. Therefore i was more than excited when Samoa reached out to me for the #Samoa40andFAB campaign! So i unleashed my glitter and sparkles and had fun all the way!! Collaborating with Joe for the online strategy, we sent 40 countdown gifts with a daily personalized message to beauty and fashion bloggers across the country, and i loved playing Mr Darcy ! The next surprise is a blogger collab for the holiday season, but I will not reveal it now: keep following Samoa's insta and fb for more. 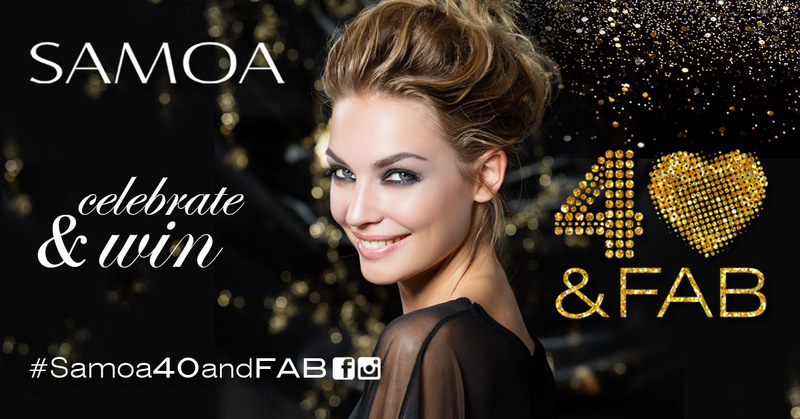 Also, make sure to share your favorite product with the #Samoa40andFAB hashtag for a chance to win the fabulous collector box or even the FAB PARIS TRIP! !